Sometimes you don’t have a lot of for your holiday in Portugal. 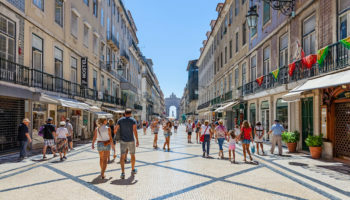 Even though Portugal is a small country, rushing from one end to the other can leave you feeling like you never really got to know the people and their culture. So its best to concentrate on the sights, sounds and tastes of northern Portugal. 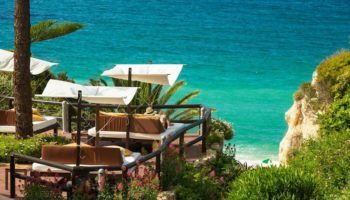 The northern part of Portugal has mountains for hiking, historic medieval cities to explore, beaches to walk upon and wines to taste. What more can you ask for. 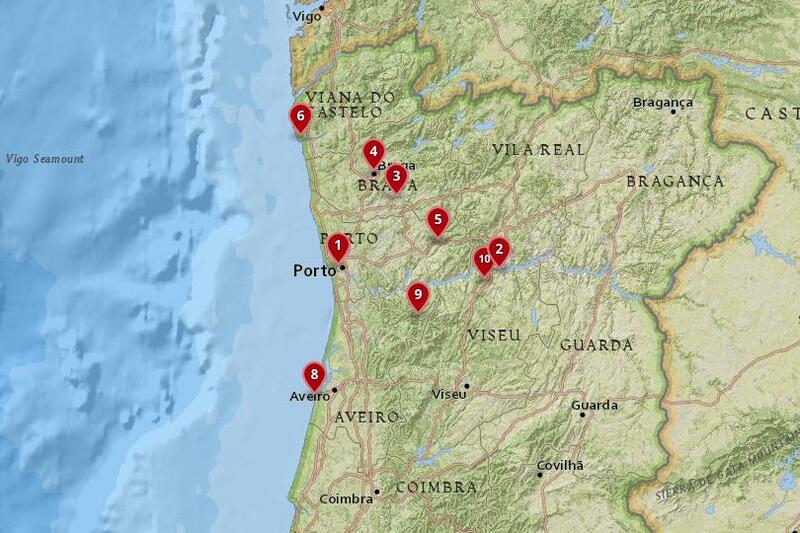 Lamego is an old Baroque village in the Douro region that is famous for making port wines. (You’ll probably want to sample some while you’re here.) Lamego is filled with history. Portugal’s first king, Afonso Henriques, ascended the throne here in the 12th century. The king built the village’s primary church, the Se. Other sights include a 12th century castle and a 13th century keep that guard the town from atop a hill. The inner town has a stone cistern left over from Arab rule. The Our Lady of Remedies sanctuary is the top attraction in Lamego. The sanctuary with its two bell towers sits above the town. If you want a unique nature experience, then the Paiva Walkways (Passadicos do Paiva) is a must-see in northern Portugal. It’s a 8-km (5-mile) walk on wooden stairs and suspension bridges that are situated along the Paiva River, considered the prettiest in Portugal. You’ll walk through lush vegetation, waterfalls, sparkling clean river water, and maybe even see some wildlife. At Van, you can even play Tarzan by swinging on a rope down to the river. 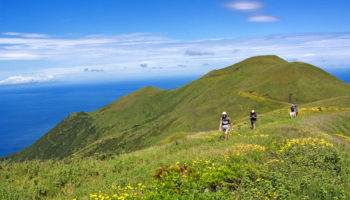 This walk definitely isn’t for couch potatoes, but if you want to try it, those who know say to start your walk at Espiunca because it’s a less strenuous route. You can travel the world over and not find too many places with houses painted like those you’ll find in Praia da Costa Nova. 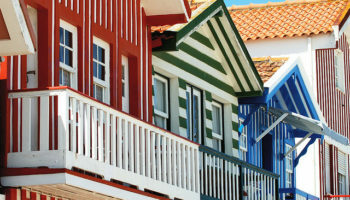 The houses in this fishing village near Aveiro are painted in colorful stripes: vibrant red, blue and green accented with white stripes. Some stripes are horizontal, others vertical and some houses have it both ways. These unique homes were originally built by fishermen as shelters; now they’re vacation homes. This is a good place in north Portugal to eat your fill of fresh seafood. Praia da Costa Nova also draws surfers when the sea is rough, which is often. Most people associate saints with doing, well, saintly things, like performing miracles. But in Amarante a saint is associated with building a bridge. St. Goncalo is credited with building a stone bridge across the Tamega River in the 12th century. The Tamega bisects Amarante, with the old city sitting on the southern bank. Known for vinho verde, a sparkling green wine, the city celebrates the St. Goncalo festival every June. Religious monuments abound, including the pretty St. Goncalo Church, which is said to look magical in sunlight. Amar means “love” in Portuguese; hopefully, you’ll love the stunning Romanesque architecture here. Viana do Castelo is an historic port city that was one of the places Portuguese explorers headed to when they returned from their voyages of discovery. Many of Viana do Castelo’s old buildings originated during this time in the 16th century. 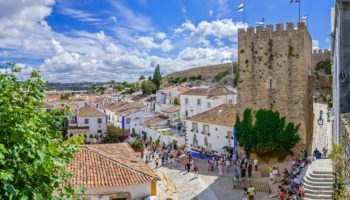 Sights to see include the 1535 Renaissance fountain in Major Square, the Geraz do Lima carriage museum, the Romanesque cathedral that dates back to the 15th century, and the Flemish style 16th century church, Misericordia of Viana do Castelo. 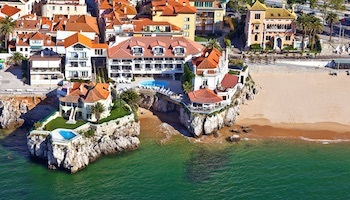 When you tire of medieval buildings, you can relax on one of the pretty beaches. Established in mountainous northwest Portugal, Peneda-Gerês National Park is the country’s only national park. Gerês, as the park is commonly known, was founded in 1971 to preserve the environment while allowing resource development. An old Roman road cuts through the park. Park officials limit tourism, but those who do visit will find a few camping areas and good hiking trails to an old monastery and a castro or old Celtic settlement. You’ll also find religious shrines near the main road. Waterfalls can be found throughout and when the water is low enough you can see the remains of two old villages, since dammed over. Braga is considered the most religious town in Portugal. Portugal’s third largest city has so many churches and monuments, trying to see them all on a day trip from Porto just can’t be done. Concentrate, instead, on just a few, starting with the Baroque Sanctuário do Bom Jesus do Monte, the city’s leading sight. Braga goes all out for Holy Week, drawing visitors from throughout northern Portugal. You may also want to visit the Archbishops Palace or a non-religious site such as the Tower of Santiago that was part of the ancient city wall. 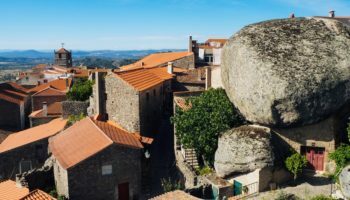 Sometimes it’s fun to go back to the beginning of things, in which case you’ll want to visit Guimaraes, regarded as the birthplace of Portugal. Here you’ll find Gothic buildings, a medieval center with narrow cobblestone streets (be sure to wear comfortable walking shoes), pretty squares with outdoor cafes and, of course, lots of history in this traditional town. Among the top sights are the ruins of an old castle that defended Guimaraes against Moor and Norman attacks. You’ll also want to take the cable car to Penha Park for panoramic views and challenging hiking trails. The Douro Valley was just made to grace picture postcards! Its scenic landscapes are just one of the reasons Travel +Leisure magazine named it No. 8 on its list of places to visit in 2017. 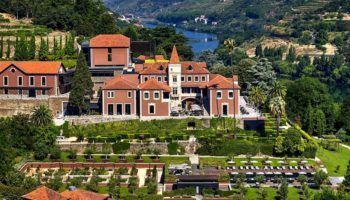 Sometimes described as an enchanted valley, you’ll see terraced vineyards growing up mountainsides, the Douro River that meanders through lush greenery, and picturesque villages. 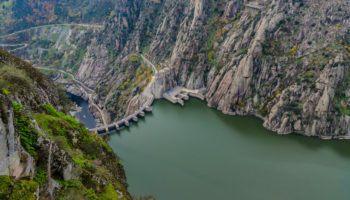 The Douro Valley is known for its table wines and port, so be sure to visit a winery where you can kick back and do a little tasting in the world’s first designated wine region. 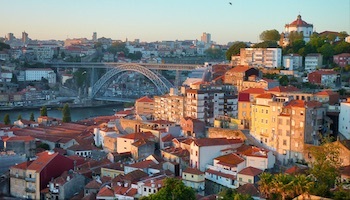 After Lisbon, Porto is Portugal’s second largest city. It’s a city that is fast becoming a top travel destination in western Europe. 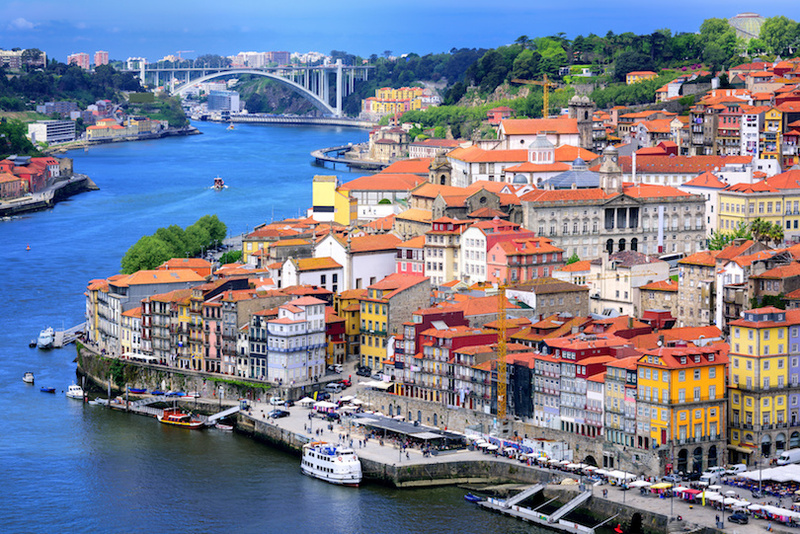 Explore Porto from its narrow streets in the old town section of Ribeira to the grand plazas in the newer sections. It even gave its name to one of the world’s most popular dessert wines, port. 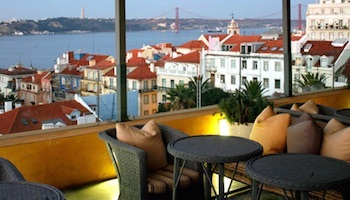 Take a tasting tour of the port wine cellars along the Douro River and perhaps experience the city’s vibrant nightlife. If history is your thing, you’ll find lots of Baroque buildings and monuments in the old town, such as the statue of King Pedro IV in the Praça da Liberdade. Thanks @Bruno, I’ll update the article.